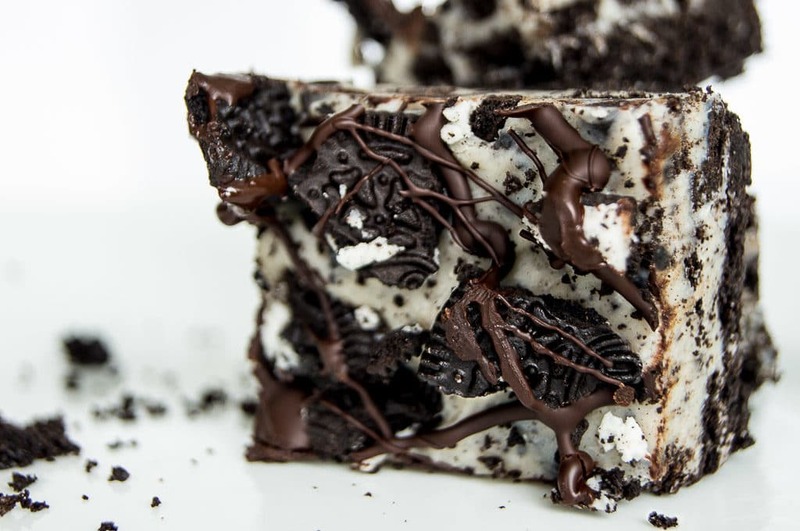 No Bake Oreo Cheesecake bars. Crushed Oreos for the base. A smooth mix of white chocolate, cream cheese, and Oreo chunks for the filling. 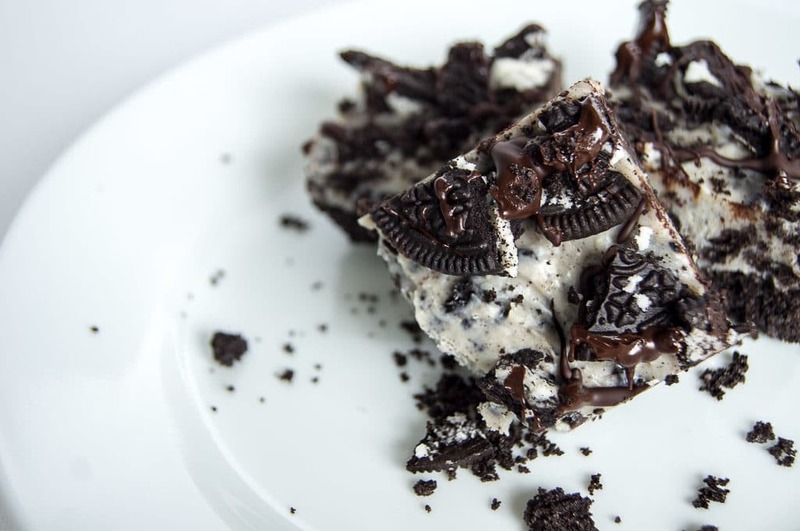 And the topping is scattered Oreos, and dark chocolate. And you don’t have to bake it. You already know you’re going to like this one. – I don’t know how to describe Oreos. – I don’t know how to shoehorn a link to one of my previous posts into this one. – I don’t know how to not eat all my Oreos during prep. You should know that they’re sweet. Delicious. But very sweet. And that was actually a challenge while testing this recipe. My initial versions were just far too sweet. Don’t worry though, I’ve toned that down by rebalancing the very technical Oreo to white chocolate to cheesecake ratio, and by drizzling dark chocolate all over the top of the final product. I know, I know. Where does such genius come from? Probably my stomach. This is actually a challenge with every one of my posts. The gurus of SEO (that is, Search Engine Optimisation) say that I should strive to direct traffic to, and keep traffic on, my blog. That I should write my posts in a way that people read one recipe of mine after another. And a lot of the time, that’s not so bad. 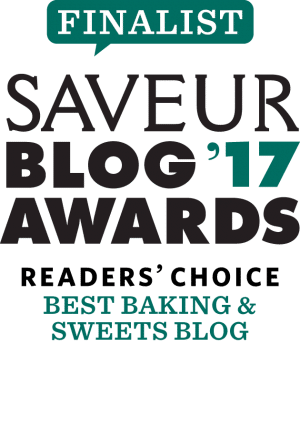 For example, if I’m writing about Croissant French Toast, I’ll link to the very easily-connected Baked French Toast recipe, or Nutella & Dark Chocolate French Toast recipe. But what do I link to in this post? I don’t have any other Oreos recipes (yet)! So do me a solid, bestie. Share this post. And write a comment below. 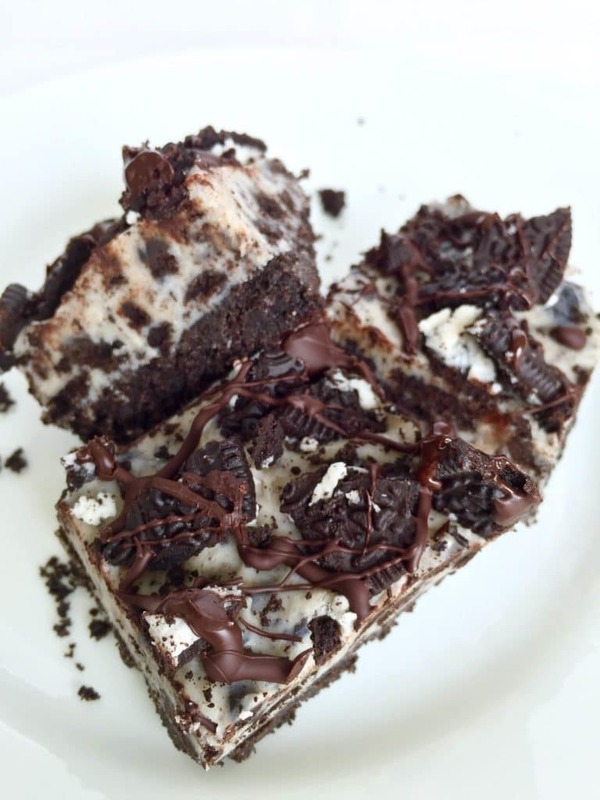 Make your own Oreo Cheesecake Bars, and post them to Instagram, with the #ChocolatesAndChai so that I can see them. Like my Facebook page. Retweet my tweets. Re-pin my pins. And come do my dishes. And because I’ve clearly not found any cunning way to promote Chocolates & Chai at all in this section about promoting my blog, please follow me on Facebook, Pinterest, Instagram, Tumblr, Twitter, and sign up via email to stay on top of everything happening on my blog! What Should I Do if I Ate My First Box of Oreos? 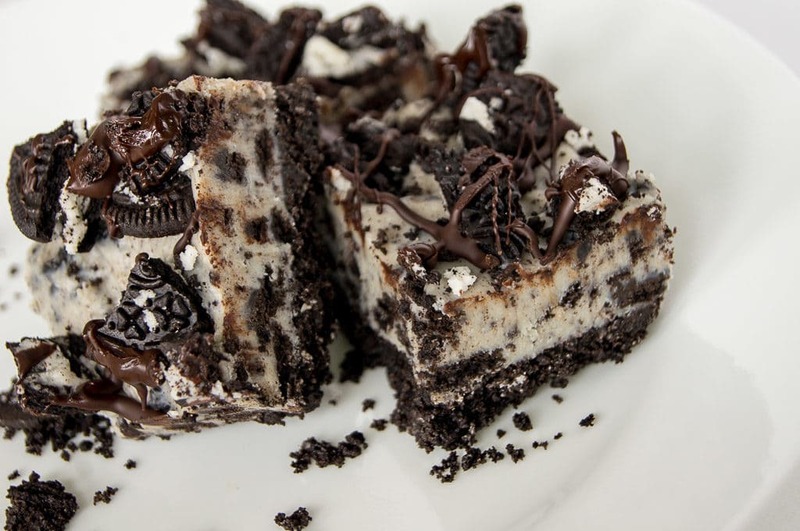 Now go eat these delicious Oreo Cheesecake Bars! No baking required. Go! Blend Oreos and butter together until smooth. Beat the cream cheese and pour in white chocolate until a smooth mixture is formed. Fold in the 12 coarsely chopped Oreos. Evenly spread the mixture over the Oreo base. Scatter the chopped Oreos over the surface. Chill for at least 2 hours – ideally overnight. Drizzle with melted dark chocolate. Cut into bars. Make it disappear with your mouth. I am drooling at these! Really like the idea of using dark chocolate and cream cheese to tone down the sweetness. A very sophistocated no bake cake. 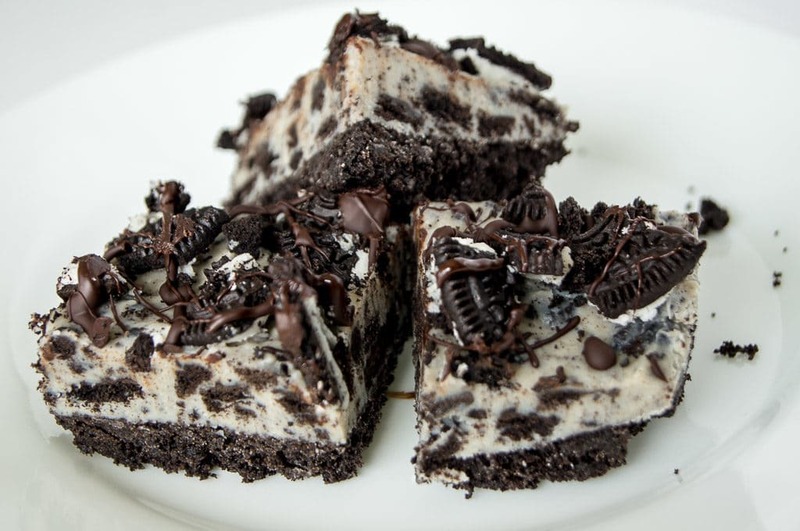 This Oreo cheesecake looks so wonderfully mouthwatering. I could easily eat a slice or two!!! Have you seen all the new flavours of Oreo that are now available?? WHAT IF WE MAKE WITH OREO MINT?! Will be so tasty! <3 Thanks for your recipe! How much would this end up with?! 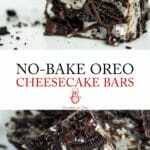 I enjoyed your entertaining post and want to make your recipe for No-Bake Oreo Cheesecake Bars for the pure joy of joining you in your fun while making them :). Thanks for sharing, Riz. Thanks for commenting Denise!! Hope you enjoy them! I found this on postris! My kids loved them! MY son wants me to make it again! Thank you! It was delicious! Will definitely make again. Thank you! Hi Penelope! So glad you enjoyed it!